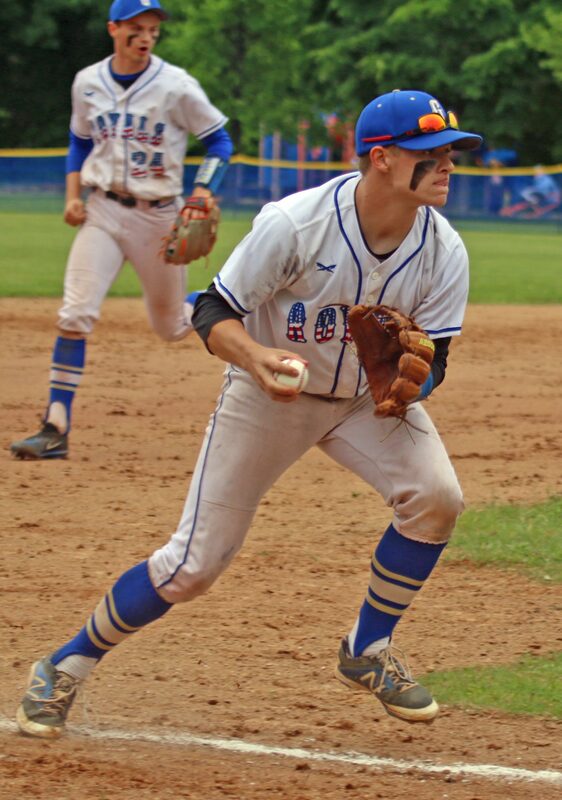 Brendan Willis tags Tommy Greene on the leg during a rundown. 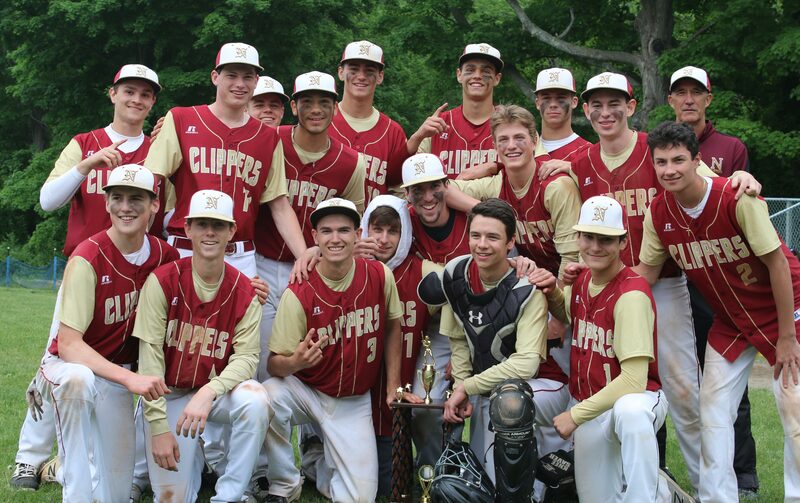 (Georgetown MA) The Newburyport Clippers won the Bert Spofford Tournament, 2-1, over Georgetown on Sunday afternoon. The tourney win was important but the way the Clippers reacted to the victory was also about post-season dreams being kept alive for yet another day. The Clippers were 3-10 on May 10th with zero margin of error left for the remaining seven games. Remarkably, they have won six straight since then including an unlikely one today. Why unlikely today? 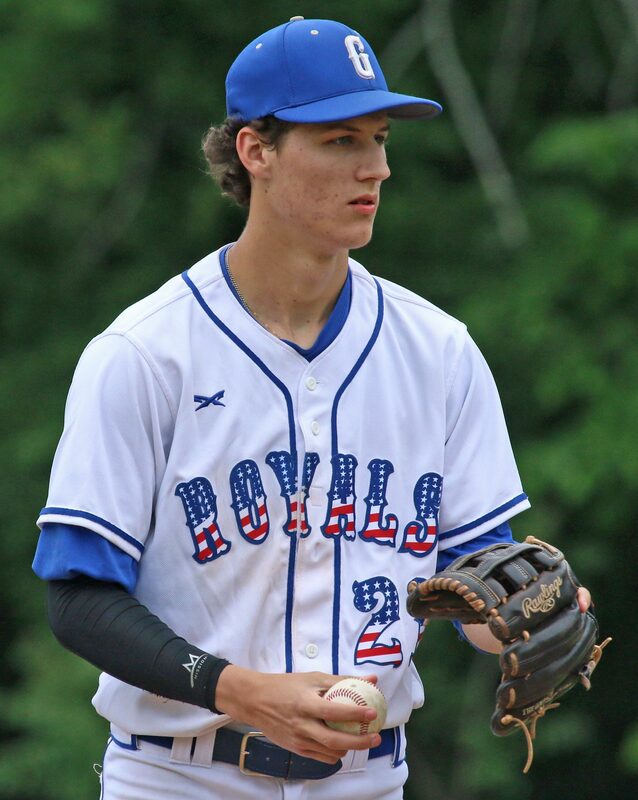 The Royals (11-7) started D1 commit Kyle Greenler on the mound. 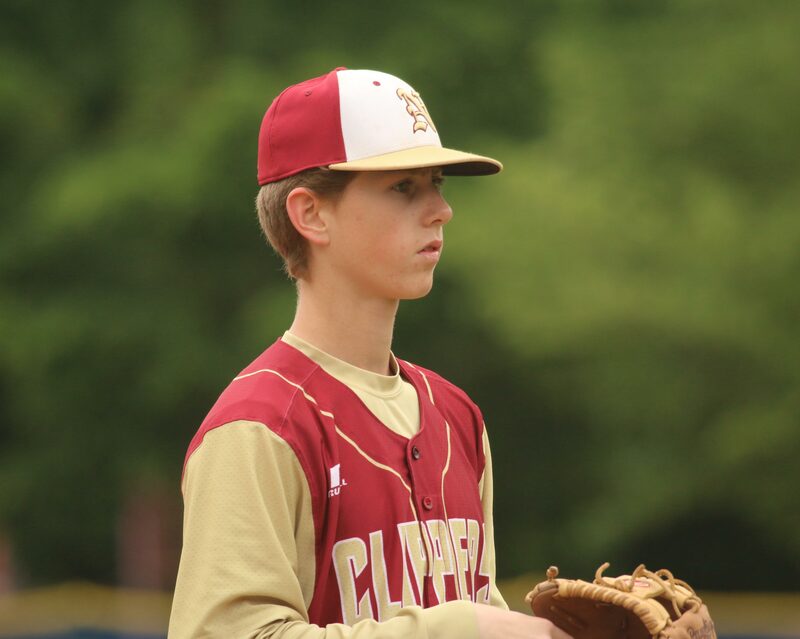 Kyle throws hard, throws strikes, and is good enough that Elon University (North Carolina) gave him a scholarship to pitch for them next year. How did the Clippers win? The Clippers had junior Casey McLaren pitching for them. Kyle and Casey dominated batters all game long. Kyle recorded thirteen strikeouts (seven of them looking) while Casey had eleven. 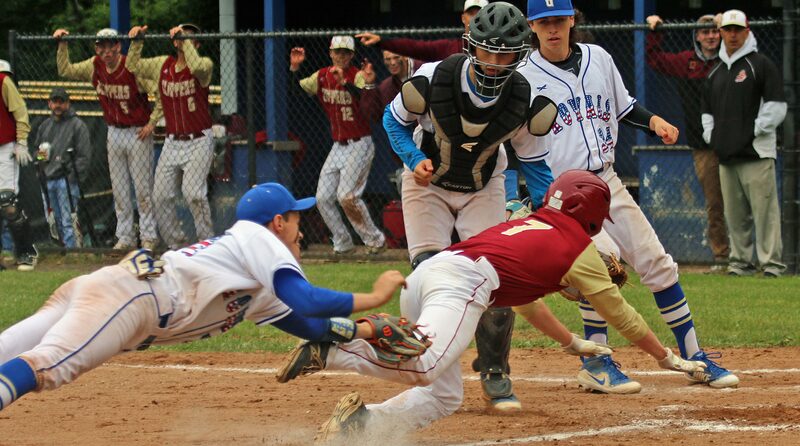 Georgetown had six hits while Newburyport had five hits. 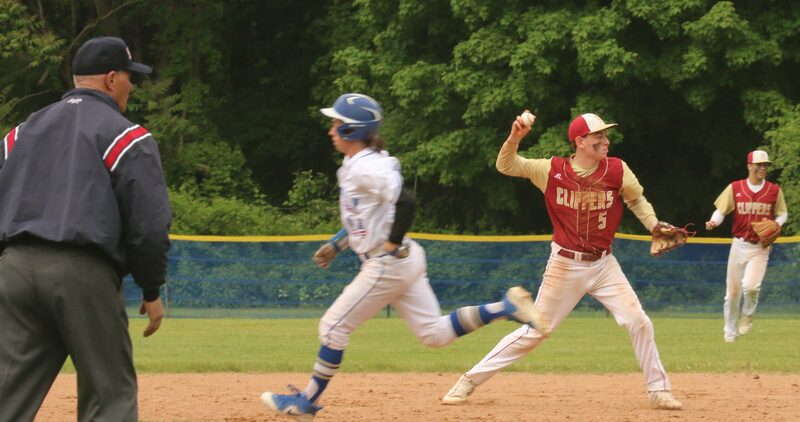 Junior Tommy Murphy drove in both Newburyport runs. 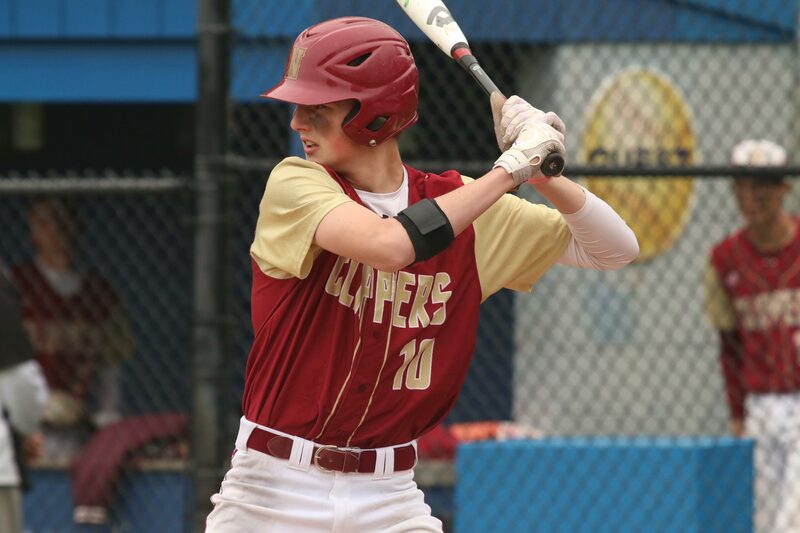 Junior Tommy Murphy was the hitting star for Newburyport driving in both runs with two singles. Sophomore Tim Chianca knocked in the Royals run. The visitors tallied their first run in the second inning. “We made a mistake early and they took advantage of it,” recalled Georgetown coach Phil Desilets. 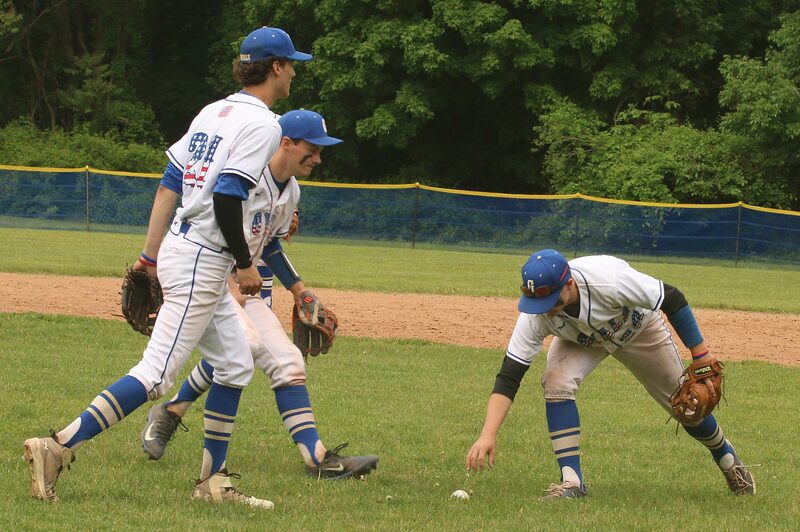 That early mistake was a bad throw to first by catcher Tim Chianca on a drop after a strikeout. That error put Tommy Greene on second base and he would score from there on a 2-out bloop single by Tommy Murphy. The Clippers added to their lead in the fourth inning. A walk (Casey McLaren), a single (Tommy Greene) and a sacrifice bunt (Parker McLaren) put two runners in scoring position with one out. After Kyle Greenler K’d Kyle Therrien, Tommy Murphy faced the Royals ace with two out and two on. 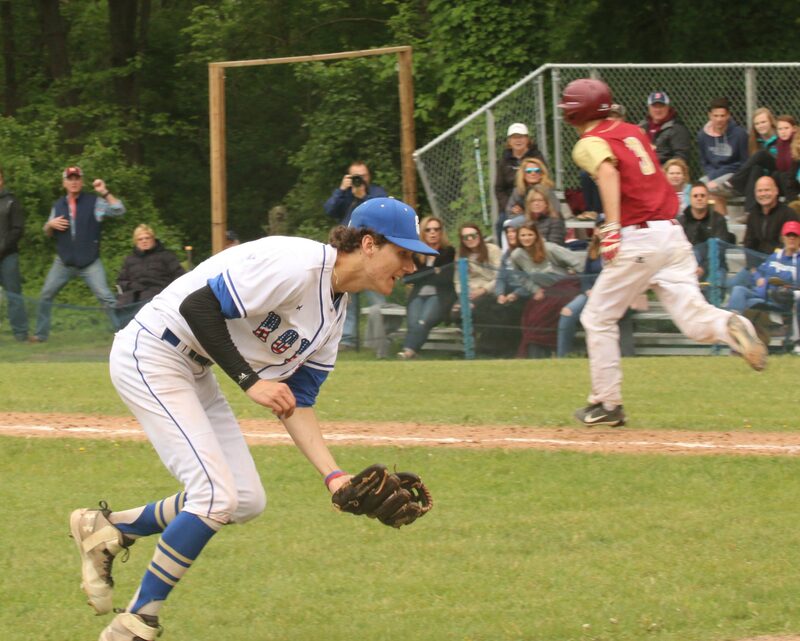 Tommy hit a grounder to deep short (Brendan Willis) and Tommy, sliding head first into first, beat the cross-diamond throw allowing Casey McLaren to score NHS’s second run. 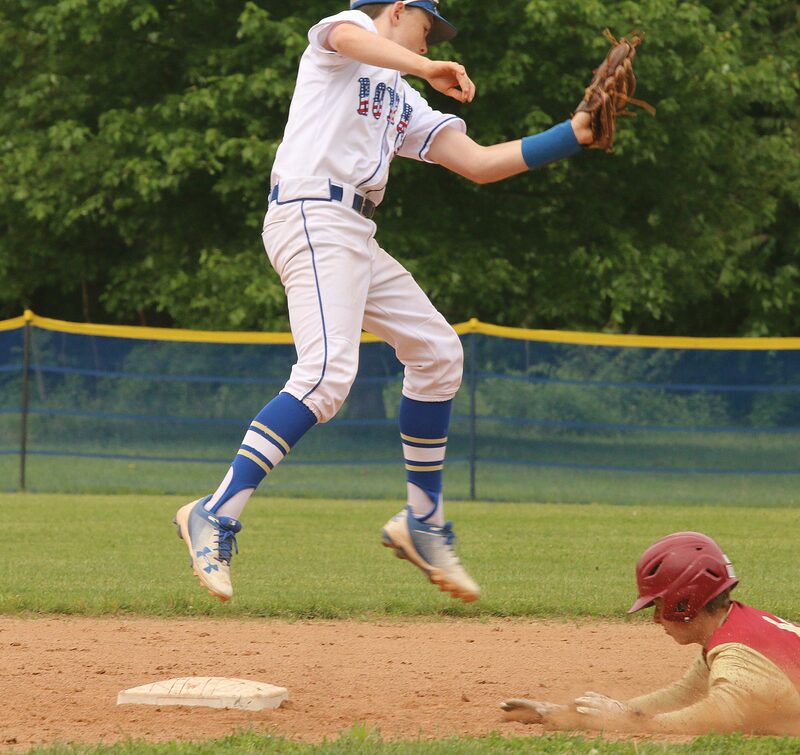 The play continued as 1B Ethan Block caught Tommy Greene off third and Tommy was eventually tagged out on the leg in a rundown by Brendan Willis to end the inning. Newburyport, however, now had a 2-0 lead. Georgetown got one of those runs back in their half of the 4th. Brendan Willis (CAL All-Star last year) singled, took second on a fielder’s choice, and third on a wild pitch with one out. Tim Chianca’s single to left brought home Brendan. 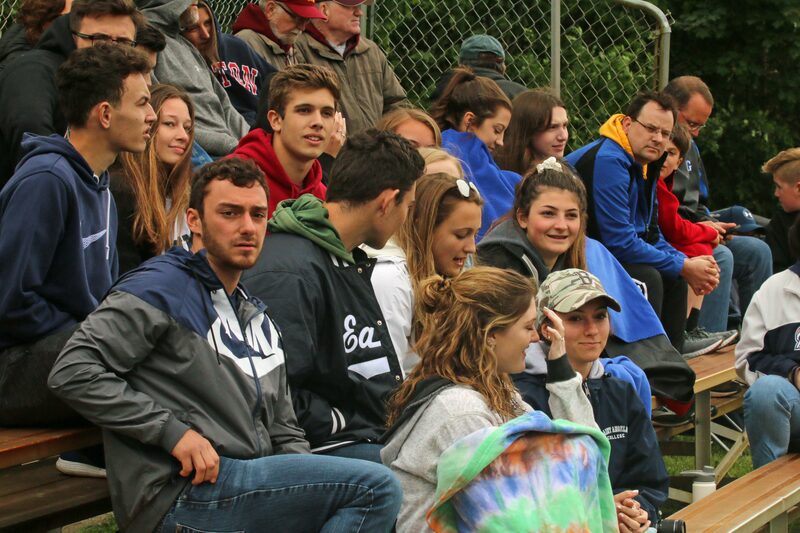 Things got very tense during Georgetown’s last at-bats. After a strikeout (Justin Ziolkowski), Jake Adamsky and Cam Martin singled. But Casey McLaren dashed any late-game Royals’ heroics by getting Max Girouard looking and a groundout (4-3) to end it. “It’s tough to lose because this tournament means a lot to us,” said Coach Desilets. “However, we have to turn the page because we’ve got bigger things ahead.” The Royals have games left with Swampscott and Masco before they start in the D4 tournament. The Clippers (9-10) will need to win next Saturday (at Essex Tech) to continue their season beyond twenty games. 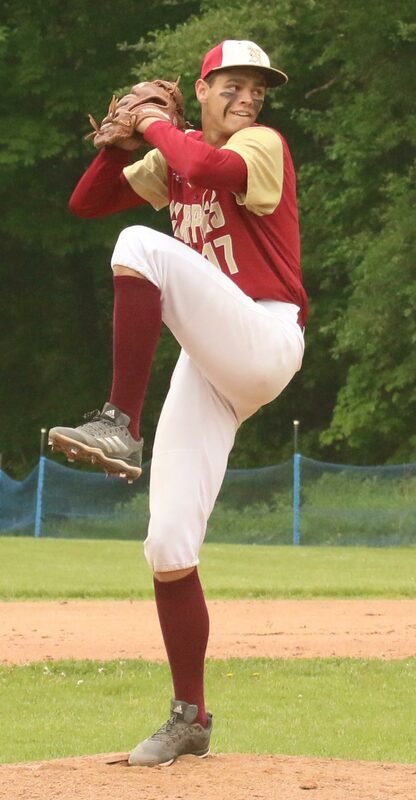 One certainty is that Casey McLaren will be doing the pitching for Newburyport. Scariest moment of the game? In the Georgetown 4th inning, right fielder Walker Bartkiewicz, chasing a foul ball, ran through a fence and totally disappeared from view. You suspected the worst when several Georgetown coaches joined Newburyport players and coaches rushing over to see where Walker was and if he was okay. Fortunately, out came his glove and he followed shortly, apparently unharmed. The Clippers had two runners in scoring position with one out in the sixth inning. Pinch hitter Ken Hodge then tried to execute a suicide squeeze bunt but got under it a little and pitcher Kyle Greenler snagged it and turned a double play. The pitching was impressive. Both could throw heat for strikes and batters had to be set for it. Both also had sharp breaking stuff and most of the caught-looking’s were on that type of pitch. The weather turned back to early April all over again. You wonder why New Englanders have so many clothes in their closets? We have to be prepared for all seasons year round! Yesterday 80’s. Today 50’s! 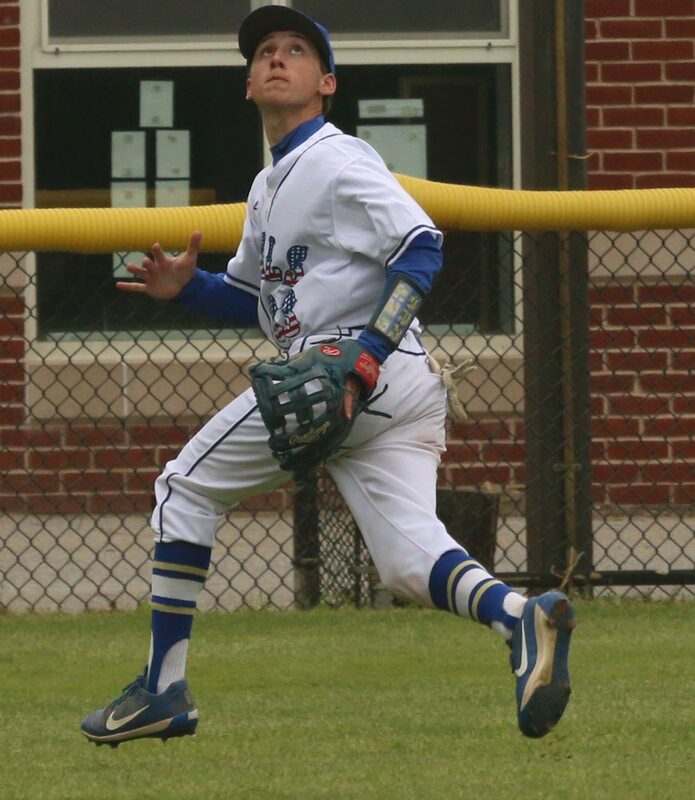 LF Justin Ziolkowski tracks down a fly ball.